The questions have been asked, the topic set, now let’s look at an example. We’ll examine translation from English to Russian: the translation speed is approximately the same for other language pairs. Our company has two basic speeds: one translator can translate 1,500 words a day with enough time to do it well and take the time to edit themselves as they work. We start to talk about 2,500 when the client uses phrases like “urgent” or “we need it yesterday.” Then the translator glares at us, grits their teeth, and translates 6,000 words per day. Now, even gritted teeth won’t help if the translation is more complex than usual. We try to involve no more than three translators on a single project. So that means 4,500 words a day in the normal scenario, and 7,500 in those undesirable extreme situations. Now imagine that someone write us saying, “Can you do 10,000 words in a day?” But we, like a good restaurant, try not to say “no” to our clientele more than we have to. So in theory, we can, but it may affect the quality of the end product. We try to turn down orders with deadlines too tight, but, technically, they are physically possible. When a PM calculates a timeline for a client, they take into consideration the volume of work, but also the complexity of the material. For example, XML files sometimes require as much as 12 hours to load into our system, and then the same amount to export the results. However, those particulars are more common with Asian languages. Thus, we calculate the number of days a translation will take based on the range 4,500–7,500 per day. But beyond translation, texts also need editing! Ideally, editing takes about half the time the translation takes. Of course, we can spend less time on editing, but anything less than 15% is dangerous, because you are highly likely to end up with mistakes in the final text. That is how each project’s timeline is determined. About a day to process incoming files (longer for Asian languages), the translation time based on the size of the team, and the editing/QA which also takes time. How do you handle bigger projects? How can we work on one text for a whole week? How often do our translators work weekends? How many hours of playtesting does it take to check a game’s localization? This touches on the question of why we can’t take on 200,000 words a month. In theory, we can, but the tighter the deadlines, the more typos and mistakes are likely to be in the result. We had a case when a client asked us to take care of a text in two weeks, so we sent it to the only translator who agreed to work on the project. As you may have guessed, the quality suffered, and we were forced to spend a great deal of additional time on editing and correction than usual. In the end, this urgent translation and its editing took significantly more time than if we had taken our time and agreed on a more reasonable deadline at the beginning, which would have improved the quality of the original translation. That’s why it’s important to understand that when the client wants to set a tight deadline, editing is bound to take longer. Or else all parties have to accept that there will be problems in the final text. Another tool to regulate client relationships at this stage is prepayment. When we met with the client, we warned them about possible problems with the quality because of the deadline, and that we’d have to correct the project after it was turned in. We asked them to pay in advance, and they did. We asked because we didn’t want to end up on the receiving end of the ultimatum “we won’t pay a cent until it’s perfect!” We know that the less time there is for translation, the more time editing requires. It’s like the law of conservation of energy: if it decreases in one place, it must have increased in another. And with payment in advance, we were able to pay our translators and set our minds on the text. There’s a superstition in the company: if a client tries to hurry the process, that’s a red flag that there are problems on the way. More often than not, when we send a text like that to production, everyone there starts clutching their pearls. When deadlines are tight, there is a high risk of seeming unprofessional to the client, so sometimes it’s better to refuse such projects altogether. As soon as the client gets used to quick turnover, they are setting a trap for us and for themselves, whether they realize it or not, and the only way out of the trap is to part ways having had a negative experience. And furthermore, in our years’ experience, we can assure you: When a client tells you that they care about deadlines and couldn’t care less about quality, they will still come complain to you about quality. Because everyone cares about quality. Because when the client hears from players saying the menu doesn’t make sense, they come to us and demand to know why the menu doesn’t make sense! “Of course,” they say, “I understood there would be some places that need fixing, but really?” It’s happened to us more than once. No one can spend all 8 hours of the work day hacking away at one text. Localizers are human, and they need to take breaks. And if they were to work on the same text for 8 hours straight, their eyes would gloss over, and the translator/editor would begin to make mistakes. So when we say that a translation will take 10 hours, it will probably not end up being 8 hours on the first day and 2 on the second. It’s much more likely to be 5 hours on one day and 5 on the second. It’s important to realize that we don’t just translate and return the text to the client. After translation comes editing and we check to make sure everything has been translated and well. The editor is also a human being who may get tired and miss some technical moments. And that is why we try to give a little time for a final review of the file before turning it in. That final check is done by the PM and for big projects, that can take a few extra hours. Let’s suppose that a foreign editor works on a text for 10 hours. We will still need a couple of hours to check the text ourselves before we return the file to the client. At this stage, we may discover some inaccuracies in the document and we’ll need some time to fix them. Editors, translators, and managers don’t work 8 hours every day without breaks. After all, localization and translation are creative work, and fatigue can affect it; additionally, the human factor is central to the process. In fact, in the average work day, a person works between 5 and 6 hours, in which those 2500 words are done. Here, there are no special structures or rules in place. We have a database where each person’s willingness to work weekends is marked. There are some contractors who don’t work on holidays or weekends on principle, and others who are fine with it. There is a catch, however. If we exclusively give someone assignments over the weekends, in a few months they will tell us to get lost. Even freelancers without a fixed schedule use the weekends to spend time with their family and friends. It’s important to understand that. 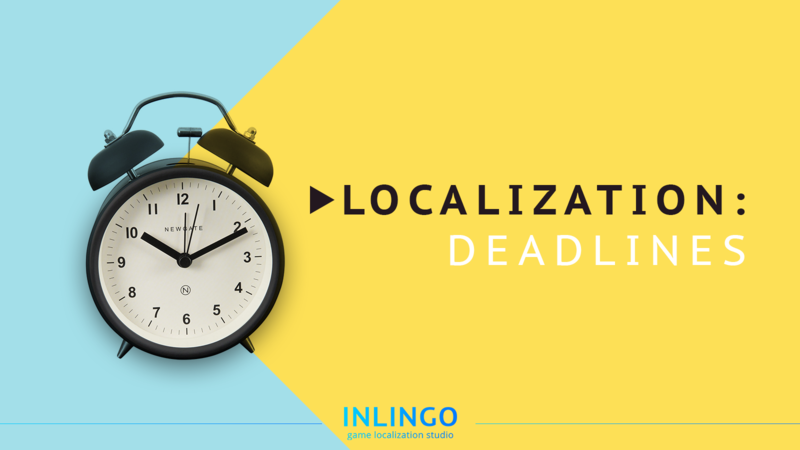 That’s why we try to avoid overstraining our localizers, but if a project really needs to be worked on over the weekends, we make sure to discuss that with the team in advance. And make sure to work with people who can agree to those terms. It’s the same with holidays. For example, Catholic Christmas is celebrated on December 25th. 90% of translators don’t work on that day. So we make sure to find out ahead of time who is willing to work on Christmas, and we warn our clients ahead of time that their usual translators may not be available. If we have someone who is willing to work, we tell the client yes, but we explain that we have limited resources for the language pair: for example, on a normal day, we may have five people, but on Christmas, just one. And they cannot do the work of five. But, theoretically, yes, we can do the translation. It’s all laid out for the client. That completely depends on the genre of the game. Match-3 games with little plot don’t need much more than an hour of testing, but a text-based quest game needs a lot more. If the game has a specific number of hours of play: 2, 3, 8, 28 hours — it’s best to test the whole game. The same principle applies to updates: if each update represents a certain number of hours of play, it’s best to test it all the way through. If the game is endless, like many MMORPGs, for example, them it’s a good idea to test at least the first 5–8 hours. 10–20 is better. In the industry there’s an unspoken rule that the first 5–8 hours of play are crucial in forming the players’ opinions of the game. So those 8 hours should be spotless. If the player gets through 8 hours and is hooked, then even if there are some small issues, they’re unlikely to be bothered by them enough to turn off and delete the game. So, there you have it. I hope we’ve answered some questions about localization and deadlines. We will be happy to answer more questions in the comments. Thank you for your time and attention.